At Creative Homescapes, we believe there’s a right way and a wrong way to do things. Cutting corners and cutting costs may get the job done quicker and cheaper, but it won’t result in the kind of work that our customers can be proud of. We take the time to do the job right, using only top-quality materials that will stand the test of time. And we only sell top-quality products from reputable vendors – the kind of products that we use ourselves every day. You can always find something cheaper, no matter what you’re buying. But we believe that quality and value are more important than just price. We are entirely committed to doing every job right. We take pride in our work and we pay attention to the details that separate good work from great work. Just like the craftsmen of the past, we adhere to an “old world” commitment to quality workmanship in every project we undertake. There’s no way around it: if you use substandard materials, you’ll end up with a substandard job. That’s why we use only top-quality materials and supplies in all of our jobs. It makes for a better product, creates better value, and results in long-term customer satisfaction. The right outdoor products can add tremendous value and enjoyment to your outdoor living spaces. We carry only top-quality brand name products. Products that truly deliver. Innovative products. Products that we’re proud to sell, and brands we’re comfortable representing because we know the suppliers and we use their products in our own homes. We partner with these suppliers because they stand behind their products. With Creative Homescapes, you can always be comfortable, knowing that your purchase will continue to deliver value and enjoyment for the long run. Everybody says they provide great service. In our experience, some don’t live up to their claims. 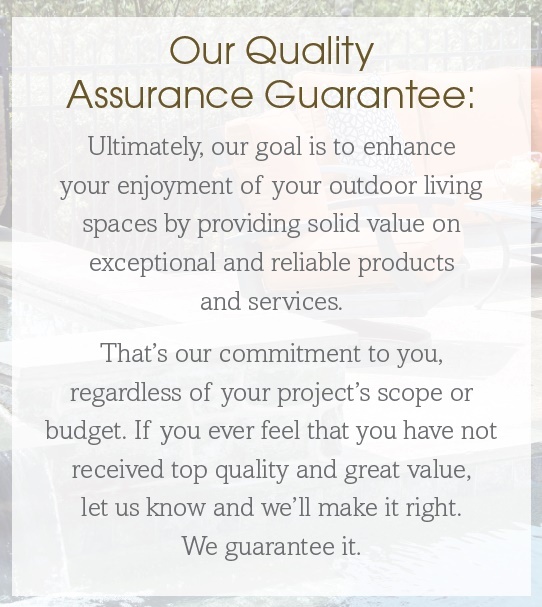 At Creative Homescapes, we’re committed to providing prompt and efficient service. We’ll always be courteous and treat you and your property with respect. And if there’s ever a problem, we’ll do our best to resolve it to your satisfaction – not just because you’re our customer, but because it’s the right thing to do. Make this the year in which you create an amazing new oasis in your own backyard. From decks and fences to pools and spas; from lighting and shade to BBQs and outdoor furniture — we have everything you need to do it right. Sound like fun? Let’s get creative!